It’s easy to think of travel insurance as just another needless holiday expense. That is, until something happens that reminds you of why you need it. Travel insurance keeps you safe, covered and protected whenever the unexpected occurs. We always recommend that you buy travel insurance for your holiday. World Nomads, which is recommended by Lonely Planet, is our company of choice thanks to its affordable pricing, great coverage and friendly customer service. Still not sure if you need travel insurance? Below, we’ve listed seven reasons you need travel insurance for your holiday, whether you’re travelling for a quick weekend break or a long-term trip. You’re on a multi-leg flight, all booked through separate airlines, and one of your flights has a two-hour delay. Not only do you have to wait in the airport terminal; you’re also going to miss your connecting flight to your next destination. Without travel insurance, a delayed flight and a missed connection can cost a huge amount of money. Not only do you lose the money you paid for the first ticket, but you also have to book a completely new connection at an inflated last minute rate. Travel insurance keeps you protected by providing missed connection coverage, which refunds the costs of rebooking a new flight. Some insurance providers will even cover the cost of a hotel room for the night while you wait for your connection the next day. It’s late at night and you’re feeling seriously ill. If you were at home, this could be solved with a quick trip to the local hospital. The only problem is that you’re in another country with a totally different language, and you don’t know your way to the nearest hospital. Travel insurance protects you from the cost of medical coverage overseas. Instead of having to pay thousands (or even tens of thousands) of dollars for care in another country, all you need to do is call your travel insurance provider and ask for the nearest supported hospital. In some cases, you might be covered for emergency assistance and airlift services to help you reach the nearest hospital as quickly as possible. With a good travel insurance policy, you won’t face the risk of paying out of pocket for healthcare overseas, even for severe injuries. From lost smartphones and pickpocketed wallets to hotel room burglaries, theft is an extremely unfortunate reality of travel. Even in “safe” destinations, bad people can view your property as a target, potentially ruining your trip and forcing you to spend your own money for a replacement. Travel insurance protects you from the cost of replacing stolen goods by letting you claim back the replacement value of lost or stolen items. Whether you lose your camera, your backpack or your laptop computer, you can claim back the cost of a new replacement. It’s everyone’s worst travel nightmare: you arrive at your destination and spend hours waiting at the baggage carousel, only to discover that your bag was either lost by the airline or sent to the wrong destination. Lost baggage can ruin a holiday, but it can be rectified with travel insurance. If your insurance policy includes coverage for lost or delayed luggage, you’ll be reimbursed for the cost of new items, from clothing and personal hygiene items to a completely new suitcase. You’ve booked your holiday and waited months for the special date to arrive. Two days before you’re scheduled to leave, a serious terrorist attack occurs in your destination, leaving you with closed airports and serious questions about your personal safety. If your travel insurance policy includes coverage for terrorism, you’ll be able to cancel your trip without being out of pocket for your flights, hotel bookings and other expenses. You can rebook a different holiday to a safer destination without potentially losing thousands of dollars. 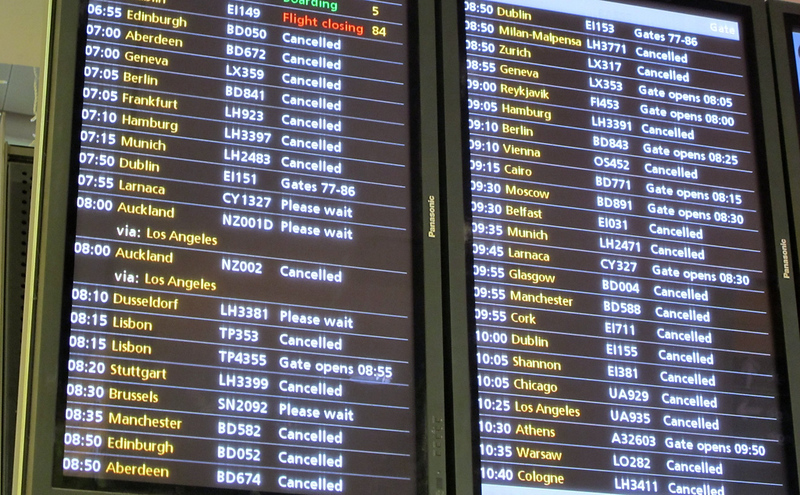 From bad weather to bad management, flights are often cancelled. When you’re booked on a flight that’s suddenly cancelled, it can throw a serious wrench in your travel plans and make it difficult to get to your destination (or get home) without huge costs. Instead of booking a last minute ticket at your own expense, travel insurance lets you refund the cost of replacement tickets caused by cancelled flights. You may even receive a refund for your hotel fees, in case a new flight is only available the next day. Sudden illnesses, deaths in the family, natural disasters and other unexpected events can put a damper on your travel plans. If you need to cancel your trip for a reason outside your control, it’s nice to know you’ll be able to recover the money you’ve already spent. When your travel insurance policy includes cancellation coverage, you can receive a refund for expenses related to cancelled trips. Instead of worrying about two problems at once, you get the peace of mind of knowing that you’ll be compensated for the money you spent on your holiday. Can you really afford to go without travel insurance? Many travellers write off travel insurance as “another avoidable cost” of going on holiday. Most are fine, but a small few learn an important lesson the hard way when a missed flight, medical emergency or sudden unexpected event make them realise the real value of travel insurance. Your safety and health should always be your top priority, no matter where you plan to travel. A travel insurance policy keeps you safe, healthy and financially secure in any country, giving you the confidence and certainty that things will be okay. Do you need travel insurance for your holiday? Check rates and buy insurance for your trip from World Nomads to make sure you’re covered for everything from cancelled flights to medical bills on your next holiday. :: Print out the Holiday Packing List PDF to easily check off all the essential items you need for your trip and ensure you remember everything. Need Help Planning Your Holiday? HolidayPackingList.com aims to be the best site to visit to help you think of everything you need to consider and pack for your next holiday. We offer helpful tips along the way and useful resources to make packing for your holiday much easier and less stressful. HolidayPackingList.com is a participant in the Amazon Services LLC Associates Program, an affiliate advertising program designed to provide a means for sites to earn advertising fees by advertising and linking to amazon.com, amazon.ca and amazon.co.uk. HolidayPackingList.com may be compensated for any bookings made through Agoda.com, Booking.com, Skyscanner.com, WorldNomads.com, GAdventures.com and any other commercial travel organisation featured on this website.